Nestled away on one of Oxford Road’s side streets lies an incredibly important piece of Manchester’s social history, the Pankhurst Centre, which was originally the home of Emmeline Pankhurst and her family. The building, situated on Nelson Street, is now host to a museum as well as its current exhibition, which celebrates the centenary of women being awarded the right to vote. I had the opportunity to speak with Dr Tessa Chynoweth, who is the Curator and Programme manager at The Pankhurst Trust about the exhibition, about why the Pankhursts are still so important today. Spread across two rooms, the left-hand side of the centre houses a museum, informing visitors about the lives and achievements of the Pankhurst family; from the highs of the efforts of the Pankhursts resulting in universal suffrage to the lows of imprisonment and condemnation from others in society. Responses and featured pieces reach far beyond the city limits of Manchester, with one installation observing Ireland’s stance on reproductive rights, a very recent topic, with the ‘repeal the eighth’ campaign having come to a crescendo in May this year. Other items displayed play on well-known ideas and issues related to women’s rights movements, such as the use of embroidery on campaign banners. Blackpudlian Gail Riding’s The Subversive Stitch (2018) depicts 12 female Morris dancers striding across the canvas, each adorned with a different face belonging to an influential female figure from the past 100 years, such as Emmeline Pankhurst as well as more recent figures like Theresa May. The ‘Northern Power Dress’ created by Rachel and Laura Beattie also pays respect to what are seen as traditional female crafts, which, in this instance is dressmaking. The piece displays the artists shared passion for art and mathematics, showing the growth of acceptance of women in a field which is to this day still dominated by men. 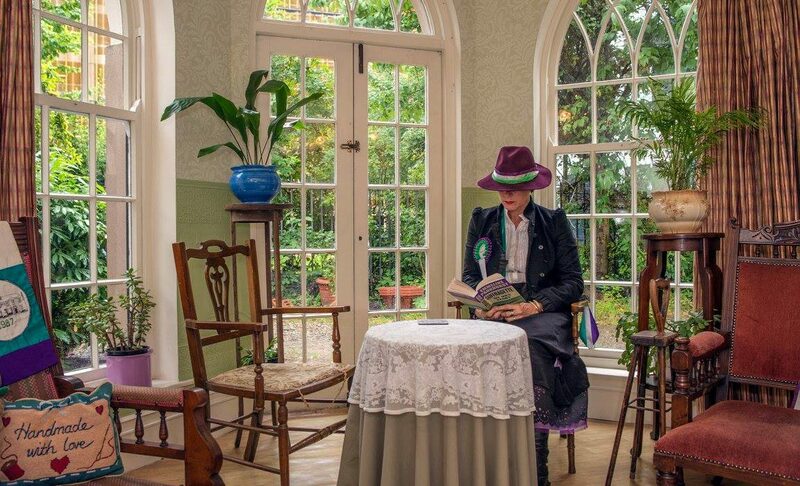 The Pankhurst Centre serves as a physical monument to where the Suffragette movement all began, and it carries on the values of the movement. “We feel that, as the custodians of the building, we have a duty to make clear the demand for equality between the sexes that took shape in the parlour of this house,” Tessa explains. The centre relies entirely on volunteers and donations, however, they have big plans for the future: “We are in the process of applying for money to transform the Centre, making it a museum befitting the legacy of the Pankhurst family, and an important place of feminist history in Manchester,” Tessa reveals. Considering the significance of Women’s Suffrage in our history, it’s important that a place like the Pankhurst Centre continues to provide a home for its story here in Manchester. The Pankhurst centre is open every Thursday and the 2nd and 4th Sunday of the month. The Centenary exhibition is on until the 10th of March.